Graduated from the Auckland School of Nursing in 1951. Worked in rural hospitals in Northland, New South Wales and Queensland before returning as a ward sister at Green Lane Hospital where she pioneered nursing care in the newly established ICU. In 1966 she was appointed nurse advisor to the Department of Health. 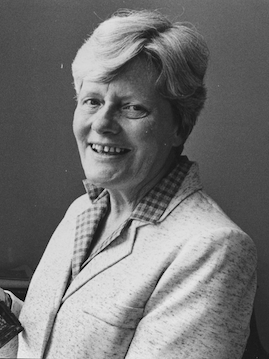 In 1971 she was appointed Principal Nurse, Wellington Hospital. This was a time of great change as nursing education progressively moved from the hospital to polytechnics. In ‘retirement’ she was a driving force in the establishment of the Mary Potter Hospice, which opened in 1990, and was the founding chairperson of the Mary Potter Hospice Foundation. She was voted the inaugural Wellingtonian of the Year in 1989, and was awarded the Pope John Paul 11 Medal for services to the sick. The QSM came in 1997.